I have been meeting with people interested in the film project Second Breath. Will be setting up more meetings in the next month. Been organizing my equipment to make it road worthy. Will begin shooting when spring is in bloom. I have been very busy with lots of projects. I am working in the sugarbush now, being with nature. Been doing phone interviews and meeting people to get a feel of how to film them. My first filming for Second Breath-Awakened Human Spirit. I traveled to the Vt Valley Tae Kwon-Do in Wilmington, Vt where I filmed George Adair. The filming consisted of people in the Tae Kwon Do community participating in class. Later in the evening I sat down with George Adair and he shared some of his stories. Your stories were inspiring. It was a great first shoot! Thank you, George and the Tae Kwon Do community for your participation in this project. I filmed Theresa and Yukio McDonough in Burlington, VT at Diversity Studios. These people are doing some really good work. They are providing the opportunity for creative self-expression and accessibility of the arts to the community. Thanks, was good to be in your presence. You can check them out at http://www.diversitystudios.com/. Thanks to everyone who came to the Summer Solstice Ceremony! Filmed Lisa Buell at the Vermont Studio Center, Yoga Studio in Johnson, VT. Lisa shared her powerful experience of Journey Dance. It was a true expression of freedom of spirit. The air was electric. Hopefully I captured this on film. I will be filming Lisa on July 8 th Soul painting and a sit down interview. Thank you Lisa for sharing a part of yourself. Jake also helped out with the filming, thank you Jake. Marci Young was filmed outside down by the pond behind her home. This was my first outside filming. It was mostly overcast with a little rain and found it a bit tricky using one big light (the sun). Debby my partner helped in the shoot, thank you ! I found shooting outside was a much easier set-up, at least for this shoot. Also for the first time I used my Sennheiser shotgun mic, thought it sounded very natural. Thanks Marci for sharing your monologue with us, sharing your experiences of couch surfing the west. It was a pleasure to listen, always wondering what or who was going to pop up next. Nice to have Willow join us as well. free, open,creative, healing and revealing. I would highly recommend this technique to everyone...it may be some of the most powerful medicine out or should I say in there. It has been a joy to see the work Lisa does for herself and others. gave us the opportunity of filming on her property. I found the setting to be peaceful and to have a very Sacred feel...at times slipping into a no time space or I suppose more like being in the moment, present. Thank you Jennifer for allowing us to share that experience. Wendy had a lot to share of her journey in the Human experience. It was really nice to hear what she was saying, because it was relavent to most people, if not all. I was finding myself identifying and having moments of self reflection. It was a pleasure to interview you, thank you. Thanks again Jake for your help & support! I had the privilege to film Martha Loving Orgain on August 28, 2011. Martha is a spirit of connection to source. Her life's work is her passion and devotion to humanity is very evident in her presence. She had the sense of a very old soul with much wisdom and knowledge. There was much to share of her journey of life and the works of Rudolf Steiner. After the filming, Martha asked if I would like to spend the rest of the day with her. She cooked a lovely lunch where we continued philosophical conversations. Later in the evening we ended up at the Charlotte beach where we experienced a storm approaching from the west and heading straight toward us. The rain storm seemed to hold some kind of powerful gifts for us. We were both thinking there must be a rainbow so we jumped in the vehicle and went searching for it. We were on a mission and at one point I said, "Wow, we can create this new TV show called Rainbow Chasers". We did find the rainbow and it seemed to complete the magical day. Thank you Martha for sharing the treasures at the end of the rainbow. Filmed Lisa & Joni at the South end of Lake Willoughby. 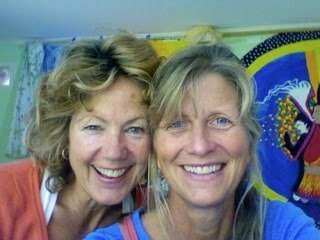 Lisa and Joni danced with the water spirits as the sun rested into the western sky. I will be taking a break filming interviews for Second Breath. It is now time to shoot stock footage for S.B.